I am trying to get back to a healthier me. I hope to work with restaurants to obtain nutritional information including calorie & fat content to share on this blog. I discovered a free app for my iPhone last summer called “lose it”. It is a lifestyle instead of a “diet”. 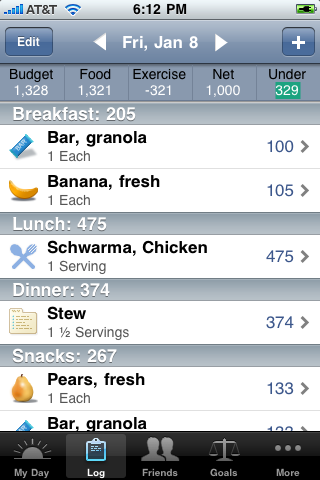 You input your food & exercise into the app to keep track of your eating & activity patterns. You choose how you want to implement this in your life; lose a little, a lot or simply maintain. The app has a large fresh food, prepackaged food & chain restaurant database. If it doesn’t have what you need, you can create your own custom foods & recipes. It also has a list of your previous meals & foods to quickly locate your regular items. As a self proclaimed “foodie”, I like to eat good food & am not willing to do a shake or rice cake diet. I don’t mind having some lighter, healthier snacks & meals but every day I still want spectacular food. I just have smaller portions. This is perfect for me, customizable, easy & free.